Righto, I have my copy and have been greedily devouring it this afternoon. The short version is: I love this book! It's sixty-two pages of iconic FF excellence. Cartography & Art: Excellent maps throughout, breaking the dungeon into easily managed sections that correspond with the larger whole. Steve "Mr. Nibbs" Luxton's depiction of the lands surrounding the mountain is a particularly evocative, stand-out piece. I'd love to see more of this style in future. Then there's the art -- it's Russ Nicolson's original work from the game book, what more is there to say except it's classic stuff, amazingly rendered. Fidelity to Source: Yes, the bulk of the dungeon adapts and stays faithful to the original gamebook, at least in terms of dungeon layout and monster demographics. It's an iconic location, and the author preserved the encounters, puzzles and traps that made it a classic in the first place. Expanded Material: That said, there's plenty of extra stuff to enjoy. Brett Schofield has done a clever thing here, inserting material from alternative representations of Firetop Mountain as random encounters. So now we have Shylock the Moneylender, the Hungry Beggar and a 'Lucky Find' imported from the board game; which I love! Previously unnamed NPCs like the Dwarves, Librarian, Maze Master and others are given further detail, making their presence in the mountain seem more explicable. Named characters, like Zagor and Farrago DiMaggio are given brief histories as well. The surrounding landscape is also explored, including the lovely aforementioned map, rumors and encounter tables, as well as brief descriptions of nearby settlements. Over all, the union of classic and expanded material really makes this feel like a complete product. Firetop Mountain isn't just a solo dungeon anymore, it's a substantial and viable adventure location for AFF parties who fancy tackling the setting and villain that started it all. Bravo. This pleases me to no end as its exactly the balance between faithfulness to the original gamebook and expanded material that I was aiming for. 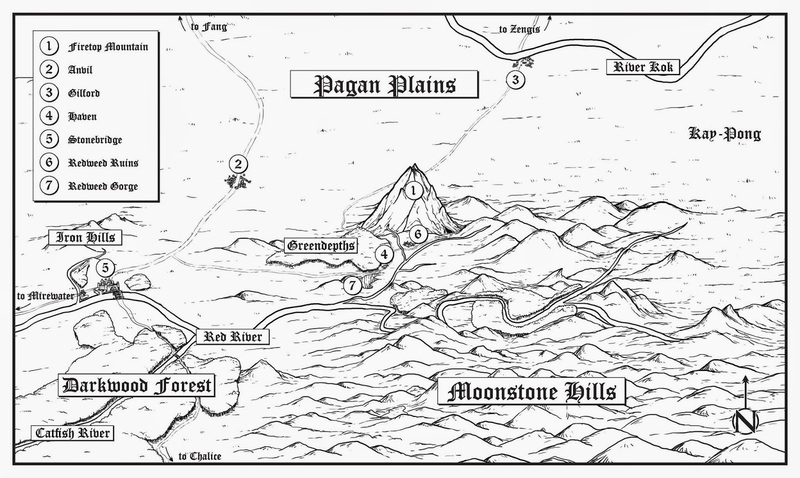 For those that are interested, here is a link to a copy of the Pagan Plains map that I drew for the book. I will upload some images of the dungeon maps in the near future. I don't mind saying that I put a lot of work into these maps! If you'd like to take a closer look at any of them, just click on the 'Download' button to the right for the original hi-res image. There's lot of little details hidden away in the maps - let me know what you find!